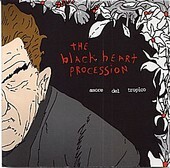 Amore del Tropico, the latest from The Black Heart Procession, is a haunting collection of dark, enigmatic tunes. Slyly incorporating pop into their folk-minded rock base, The Black Heart Procession creates a late night, fighting-to-stay-awake soundtrack for the insomniacs and graveyard shift workers of the world. Shaking you out of your half-conscious state, you wake up with the blue screen on your TV guiding your way, still confused as to what is happening. Amore del Tropico is the sudden shock of waking up put to music, the perfect album to play for late night conversation or to help you quickly enter slumberland. I'll give it an A-.